‘Tis the season to get festive, Astoria! As we’re officially in holiday mode, we thought it’d be great to profile someone who truly helps to ring in some local holiday cheer. 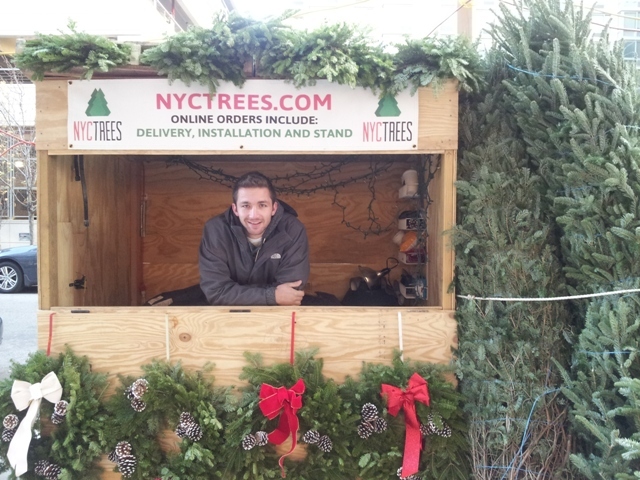 Meet Harry DeLucia, the founder of NYC Trees, a local company which provides Astorians, LICers and even city folk with regionally sourced trees, and with it services such as delivery and installation. Being an Astoria native, Harry is deeply invested in the neighborhood. When he’s not selling trees, he’s often distributing fresh fruits and veggies to local restaurants, such as our beloved Vesta. But currently, you can find Harry selling his beautiful Christmas Trees, either in Astoria (21 st St. and 28th Avenue) or LIC (in front of Food Cellar). 1. What’s your business and what inspired you to start it? Harry DeLucia – Being a native New Yorker, we know how many people love Christmas and enjoy the unparalleled smell of a fresh cut tree to have as the centerpiece to their holiday festivities. We also know New York, and doing anything in the city can be a hassle. Instead of having to worry about picking the perfect tree and lugging it back home then up to your apartment, you can have a beautiful Fraser fir delivered to your doorstep within 1 hour. Eliminating the hassle out of the holidays is the foundation of NYC Trees. 2. What’s different about your trees? Where do they come from? HD – Each year you will see the streets filled with Canadians bringing down trees and then head home without having any of the money filtering back into the local economy. Our trees are all regional; the majority come from sustainable, family-owned farms in New Jersey. Through our family farm in New Jersey we’ve been supplying fresh fruits, vegetables, and cut flowers for many years on 30th Ave in Astoria, in front of Vespa Restaurant on the Upper East Side, and this past year from June through October at the L.I.C. Flea in Long Island City. Knowing the importance of community backing, we do our best to support local farming infrastructure and buy all of our trees locally. 3. What special conveniences do you offer to Astorians and LICers during the holiday season? HD – For those holiday goers that enjoy coming down to the stand to hand select their family tree, we have a stand on the corner of 21st Street and 28th Ave in Astoria and another in front of the Food Cellar Co market on 47th Rd in Long Island City where Astorians and LIC residents can meet the NYC Trees team and select a tree for themselves. As always, delivery and installation are still options for people visiting the stands, not just online. 4. What do you do in the “off-season”? HD – Off season? I wish there was one. Life seems to always stay busy. My main job and my first love, is teaching. No matter how exhausted I am, when I am in a classroom or gymnasium with my Health or Physical Education classes, my kids quickly pick me up and brighten up my days. When I’m not teaching, from June to November my brother Louis and I run our local farm markets every weekend until November rolls around and we start preparing for our Christmas tree season. If there was ever an off-season per say, the spring would be it. Spring for me is all about rugby. I founded and coach a boys and girls team at my school, Columbia Secondary in Morningside Heights, who I may add won the 2012 Rugby 7’s PSAL Championship for New York City in both the boys and girls divisions in their 1st year of competition. I’m also enrolled in grad school. Life is always going to be busy for all of us, doing what you love is the key, I never dread waking up and completing the numerous things I have on my plate, because I truly appreciate and am thankful for each aspect of my hectic day. 5. What are some of your favorite Astoria and LIC haunts? HD – Coffee and a morning tart at Astor Bakeshop. The owner, George McKirdy, is a huge supporter of our farm and purchases a lot of fresh produce to offer in his menu. For an amazing Greek dinner,Taverna Kyclades on Ditmars Blvdin my opinion isthe best place to eat in Astoria. Hidden gem – right next door to my house is El Ancla, a great Peruvian restaurant with the best chicken I’ve ever tasted. Affordable bite – Pita Hot on 30th Ave. Kahlid the owner makes the best falafel and other healthy Mediterranean dishes that will save your wallet and leave you feeling great. There are so many amazing places in Astoria, thus why I do and will forever call it my home. 6. 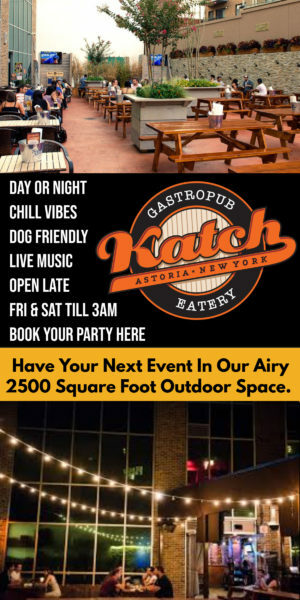 Why do you heart Astoria? HD – Astoria is a real community. It’s a huge mix of culture and people that make it so amazing for anyone to live there. A while back, National Geographic did a story about the diversity of Astoria and on the front cover pictured the Hells Gate Bridge with the headline ‘Astoria to Africa’ in which the article discussed a study that suggested Astoria was one of the ‘most ethnically diverse places in the world.’ I love walking down 30th Avenue to the train station and saying hello to local business owners and neighbors, many of whom support my farmers market opposite Mt. Sinai each summer. I feel very safe here and respect every neighbor as we all watch out for one another. 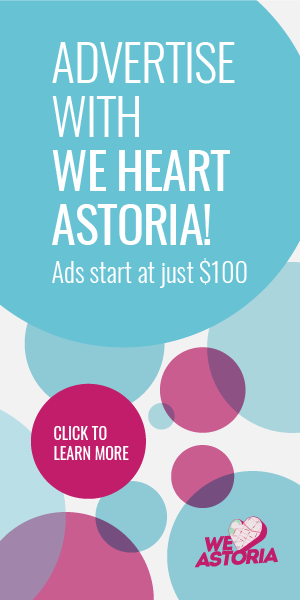 We all heart ASTORIA! Thank you Judith and the We Heart Astoria team for highlighting not only local products, but local Astoria entrepreneurs!